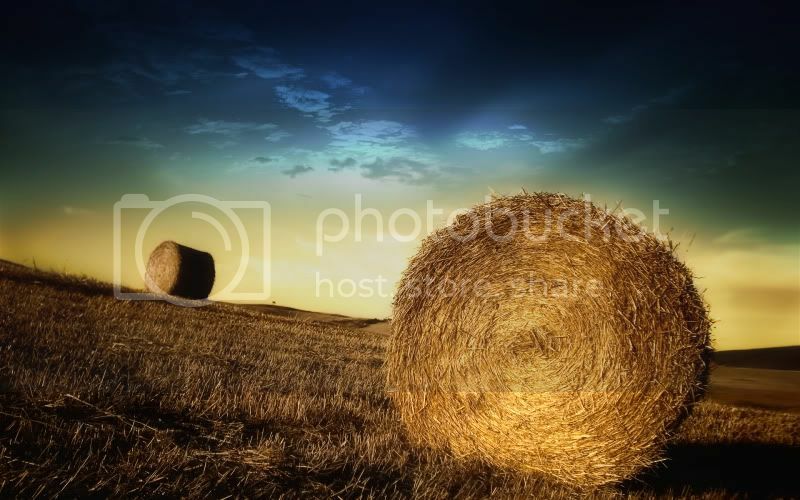 I absolutely love the sight of fields full of hay bales at this time of year. It's really relaxing. Like everything's okay, whatever awful things are happening in the world, because nature is carrying on in its usual way. And the fields are such a beautiful colour, this warm gold that lights up the day, even if the sky is dark. This isn't my picture. I'm nothing like that good a photographer. It's from a website I found called Socksoff - http://www.socksoff.co.uk/walls09.html. Fab wallpapers in different sizes, and incredible quality. This reminds me of a picture an old friend took a long time ago. I loved it and always admired it when I was visiting him. And when I got married, we received as a wedding gift. Gonna see if I can find it now, and scan it for you. I've got to show it to you. I would love to see a picture! That's a beautiful thing to give as a wedding gift. I have focused on photography for about 1 1/2 year now, and don't know how to do about anything. I am good in Photoshop though. I shoot RAW files, which mean I can change basically anything afterwards. I can change white point, vibrance, saturation etc.... everything in a much better way than just doing it on Jpgs in Photoshop. It is really like testing out the settings of the camera - AFTER you have taking the pictures. So that is fun and handy - but not at all as impressive as those who did it the old school way! It's absolutely beautiful! So clever to do that with a non-digital camera. I'm a point-and-shoot person. You're welcome re the flower. They were so pretty, even though they're just little icons. We had a whole row of sunflowers come up one year, and when they flowered, they all turned their heads and looked over the fence. sorry for interrupting your discussion. Ah. I heard of silage. That's what it is, then. Is it for winter feed? Both things are also for the winter. the difference is that hay should be completely dry and it shouldn't rain on it. Silage on the other hand can be also a little bit wet. when the weather situation isn't great, it's easier to make silage and not hay. There's also a fermentation process within the bales. not sure how I should explain. hope you have an idea about it. Isn't it pretty? I just love that kind of scene. Could lean on the fences and watch all day. beautiful pic! 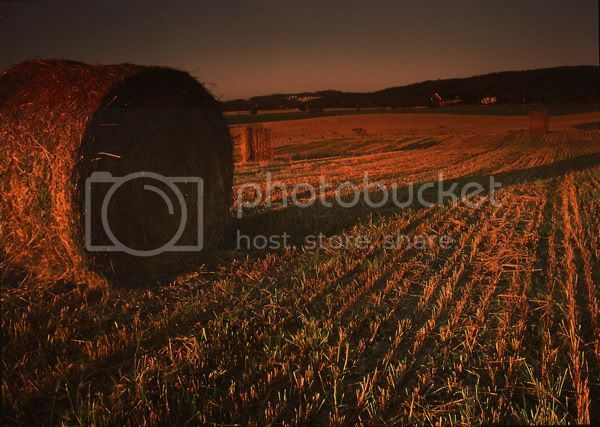 I also love it when the bales are on the fields. thankfully our straw bales and hay bales are all at home, so basically work is done for now! but at least I got a slight tan! I hope the weather was good for you. We just had a massive thunderstorm. Still not sure where our little cat is. Must be horrible hard work shifting bales, even if they are mini ones. Do you use a machine? Now, that looks like fun! last week the weather was very hot. every day over 35 degree. The forecast predicted thunderstorm for today. My cat also had a baby cat. She's so cute. Yes, she brought a mouse in for us during the night and was curled up all asleep and cute beside the bed in the morning. Heh, reminds me... there's a small farm somewhere around here, and they stack two of those straw bales on top of each other and then dress them up as dolls... (not all the bales of course, just one straw man and one straw woman to stand in front of their driveway). You're welcome! I thought I hadn't spoken to you for a while, and you might like a pretty flower.